British supermodel Lily Cole has scored straight As in her A-levels to secure a place at Cambridge University. The 18-year-old passed English, politics and philosophy and ethics. Lily, who is on holiday, has deferred the start of her degree course until 2007, when she will study social and political sciences at King's College. A spokesman for Latymer Upper School in west London, where a record number of pupils won Oxbridge places, said: "We expected her to get the grades." Another star of the small screen is also hoping to go to university after receiving her A-level results. Holly Grainger, 18, from East Didsbury, Manchester, is a regular face on television, with role in Terry Pratchett's Johnny and the Bomb and legal drama New Street Law, to be broadcast later this year. And she was still celebrating landing a main part in the school drama called Waterloo Road, when she found out she had received As for biology and English language and Bs for English literature and general studies. The Parrs Wood Technology College pupil also achieved an A in AS-level Spanish. "Last week I found out about the part. I started filming on it yesterday and today I got my A-levels," she said. 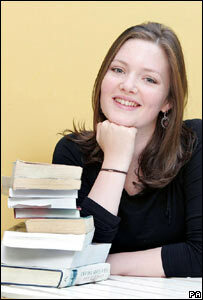 Holly now hopes to study English at Leeds University. "Acting is what I love the most, and I really want to carry on and pursue it as a full-time career in the future," she said. "But it is a very unpredictable lifestyle so I thought an English degree would give me more options. "I wanted to get another qualification under my belt just in case." Are GCSEs easier than O-levels? What is the future for A-levels?